Elegant apartment in the heart of Rome just a stones throw away from the Coliseum, Roman Forum, Mouth of Truth, and all the major important historical sites. 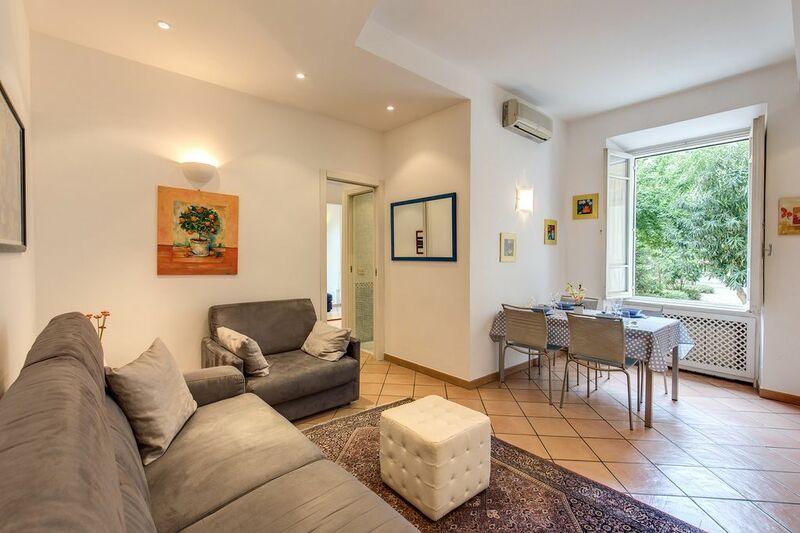 The property is within walking distance to Piazza Navona, Fontana di Trevi, Spanish Steps, Pantheon, Campo dei Fiori and across the Tiber river to enchanting Trastevere, famous for its narrow streets and cozy restaurants. The location simply could not be better as the area is one of the most famous and picturesque of the historical center, surrounded by archaeological sites, artisan and antique shops, theatres, traditional bakeries, colourful markets, designer stores, boutiques, restaurants, typical Italian cafes and winebars where you can flip away your tiredness over a good glass of wine. Only a couple of blocks away, there is a colorful, large open market and every morning can be found fine food, fresh produce, fruit, vegetables, wine, cheese and wonderful bread. The apartment has been newly renovated to offer elegance, comfort and convenience to the most desirable attractions of the city center. The property is on the first floor of a 19th century historic building. After a day's sightseeing in the noise of a busy city, this is a great place to come home to. Walking through the main doors (off the street) into a lush garden full of trees and flowers, is such a pleasant surprise. Coming back here, in this oasis sheltered from the hustle and bustle, at the end of a long day gives you an instant sense of peace. The quiet found inside is unusual for this lively section of Rome. During the day, a security guard is present by the front gate. In addition to the gate (locked after dark), there are locked doors for both the complex and the apartment. Fully renewed, it is tastefully furnished with fine modern fittings and the same remarkable equipment. Elegantly appointed with artistic and decorative features as beautiful pictures and mirrors, exclusive tapestries, cozy sofas, modern sliding doors, lamps, large wooden walk-in wardrobe. The apartment has a very warm atmosphere. It has an entrance that leads to a bright living-room, a dining area with american kitchen, the bedroom, the bathroom and walk-in wardrobe. The sofa is a comfortable sofa-bed (King size, excellent quality), there is also a single bed. The kitchen has all modern fittings and it is fully equipped with all necessary cooking supplies. The apartment has every comforts: air conditioned, autonomous heating, Satellite TV, flatscreen TV, FREE WIFI internet, washing machine, telephone, safety box, radio, iron/ironing board, hair dryer, Bed linen and blankets, bath towels and table linen provided. Just a few meters from the property you'll find the famous mediaeval basilica church Santa Maria in Cosmedin (or de Schola Graeca). The church was built in the 6th century over the remains of the Templum Herculis Pompeiani in the Forum Boarium and Its bell tower is the tallest medieval belfry in Rome. In the porch of this mediaeval Church, on the south side, there is one of Rome's symbols, the so-called 'Bocca della Verita' Mouth of Truth that draws many visitors: this is a large round stone, with a grotesque face in relief with holes through the eyes and the nose, and a larger opening for the mouth. While in Rome you may like to re-enact the scene in the film Roman Holiday and put your hand over the Bocca della Verità or Mouth of Truth which hangs in the portico of the Church of Santa Maria in Cosmedin.If a jealous lover wanted to test their partner’s fidelity, they would put their hand in the mouth of the stone river god - it was thought that a liar would have his hand bitten off but the faithful lover would go untouched. And this 'test' is still a must for all tourists and the queue of visitors stretched right down the street, for to have their photo taken with their hand in the mouth of the statue. It’s a fun thing to do though and everyone seemed to emerge with their arm intact - why not give it a try? Italy is a country full of glittering treasures and Rome is its brightest jewels. I am delighted to be able to offer a comfortable and beautiful ambiance to my guests. Every amenity and comfort is well thought out and we make sure that the apartment is clean and in excellent condition at all times. I take pride in meeting the needs of my traveling friends while helping to make their stay in Rome a memorable one. It is important to me to put the needs and comfort of my guests first and I am honored to say that this is gratefully reflected back to me through referrals and returning guests. My apartment is truly a 'home away from home'. The location simply could not be better as the area is one of the most famous and picturesque of the historical center, surrounded by archaeological sites, artisan and antique shops, theatres, traditional bakeries (15 meters from the apartment), colourful markets, designer stores, boutiques, restaurants (10 meters from the apartment), typical Italian cafes and wine bars (10 meters from the apartment),.. The apartment is right in the historic centre of Rome and from here you can walk to every important interesting point without public transport. However the apartment is very conveniently connected to any city landmark and to Airport by fast and efficient public transportation ( both buses and subway ) and you will enjoy the real Italian style everyday life. Upon request you can book a transfer from and for Fiumicino or Ciampino airports with our chauffeur driven transfer. You can request the service by sending us an e-mail including your flight details. Fantastic location for an unforgettable holiday in Rome! The entire apartment is for your own use. The property provide 2 different size of Espresso machine. Will be provided sugar and coffee. there is a new one! The property provides any utensils, dishes and any other kitchenware. It serves 5 persons. you will find books for all age! This ground floor apartment is off a central courtyard of an apartment block so is really quiet. It's well laid out and tastefully decorated. The bed, while large, is not a full American King. The kitchen is well equipped. We were met on arrival and the owner successfully arranged a car for our departure to the airport. The advertising is a tad deceptive. It is about a half hour walk or fifteen minute bus to any of the tourist sites one might be considering in central Rome. That said, this Testaccio area to the south of the center is an interesting place to be based and we would come back just to explore the area more fully. There is great coffee right next door and a nearby (nine minute walk) daily market offers all kinds of food products - fish, meat, cheese, wine, etc.etc. in dozens of stalls. There are nightclubs and well-recommended restaurants nearby also. So nice, clean and comfortable! We stayed for five nights in late September. While a bit smaller than as it appears in the pictures, the apartment was perfectly adequate and quiet. The location is superb. The trattoria next door is always jammed but the usual good Roman restaurant. The caffe at the end of the street is perfect for the morning. We wouldn't hesitate to stay here on a future trip. Btw anyone needing a hotel near the airport, I highly recommend hotel tiber. Cool, clean and comfortable! Great neighborhood, quiet and convenient to everything. Would definitely stay here again if traveling to Rome! Just as pictured. Easy to catch public transportation. Great location in the Testaccio area. Suggest you take the food tour of the area early during your stay- found on travel web sites. Many great restaurants and all amenities within walking distance. The area around the house is surrounded by: restaurants, pizzerias, traditional bakeries, supermarkets, groceries, pubs, Italian's cafè, artisan and antique shops, boutiques, wine bars, bakeries, colourful markets, designer stores, churches, museums, library, theaters, cinemas..